In colder areas of the country keep a home warm is an essential requirement when building. 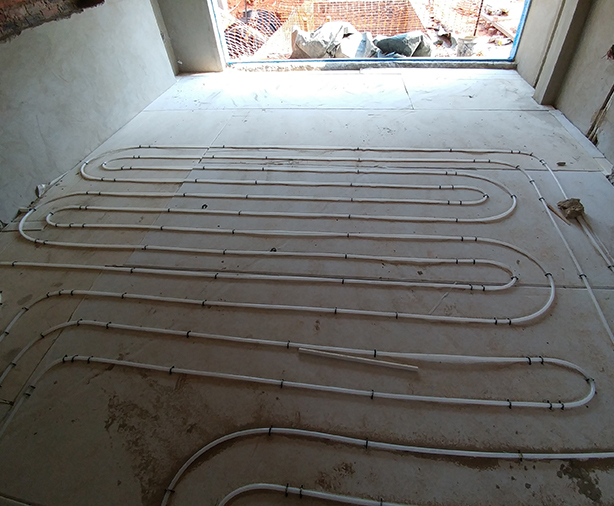 A lot of people go for the more cost effective electrical underfloor heating but the running costs of a typical electrical underfloor heating system far out ways the value provided by it. The answer to heating a house is water based underfloor heating. The water is heated through solar thermal energy and the secondary heating source being a heat pump. The floors are insulated with polyurethane boards to prevent the heat from being lost. The floor is rigged with a special type of multilayered pipe in grid, these grid are controlled by thermostats. Each room or are can be controlled to a different heat similar to the electric version of the underfloor heating. In summer when you no longer need the rooms heated this heating source can be used to heat the swimming pool or cold water can be passed through the system to cool the floors reducing the amount of power the aircon requires. A lot of the systems we install have the buildings potable water connected to the same tank reducing the capital outlay on the various technologies.